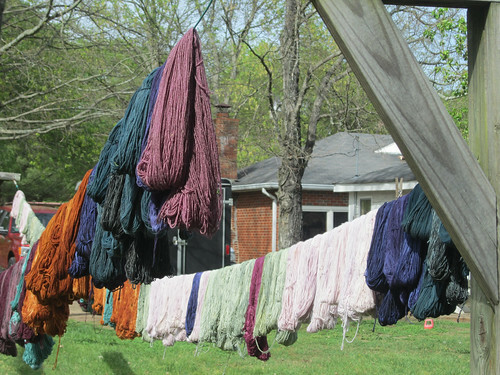 We got the last of the dyeing finished yesterday. 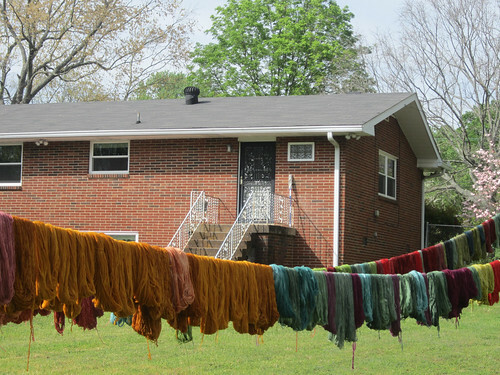 We did 1,224 skeins in 5 days. The hand painted colors we did firs,t took two of those days even though we only did 256 of them. We can only get about a maximum of 125-140 of those done in a day due to the process. Semi solid colors, on the other hand, are a different process and we can get about 450 of those done in a day. I plan to take the rest of the weekend off while we are waiting for the last day’s batches to dry. Monday we will start the sorting and labeling, which takes a considerable amount of time, as you may imagine. Fortunately, many hands make light work and this is an easy task to get even the younger ones to help with. I have the task of “quality control manager”. 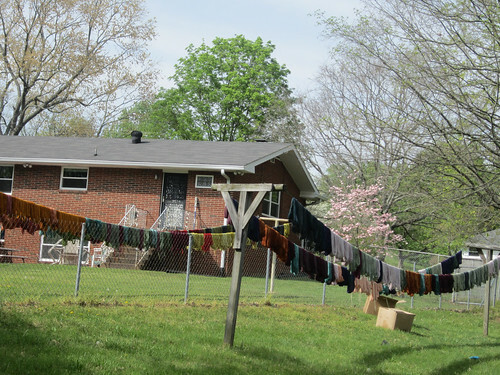 I, or one of the adult assistants, (my oldest daughters) inspect each skein for neatness before they are labeled. 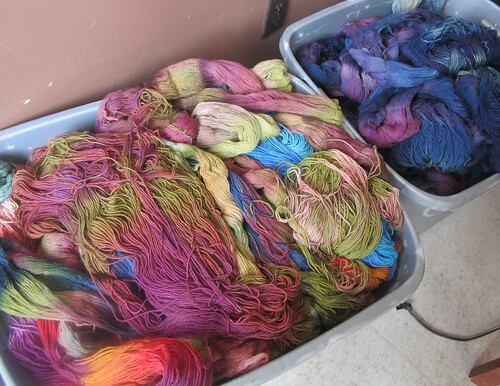 I usually get the task of re-skeining any that are too snarled from the dyeing process. I have devised a system to reduce the likelihood of that necessity, but there are always a few, despite the measures. This last portion of the work is a big job, but I am always glad to get to this point, since at least all the really messy, sweaty part is done. Sorting and labeling can be done sitting on the couch one box at a time, and so is not nearly as tiring. 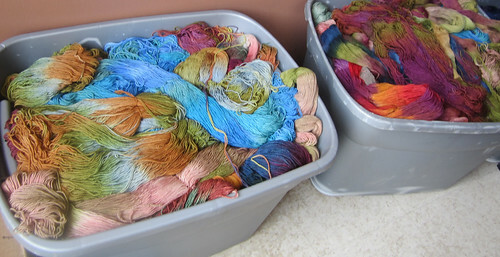 Not to mention the satisfaction of seeing the somewhat messy jumbles of yarn all over the place become neatly labeled and organized skeins that make you want to just wind one up and get out your needles. Speaking of knitting, I fear I am becoming more and more disenchanted with my Gemini sweater. I didn’t care for some of the design construction and altered it. I could see that the way she had designed it the sleeves were going to be over 18” around and in the yarn I am using that was clearly not going to work well. So, instead of the increase rate of every row until a set amount of stitches were reached and then continuing until a certain length, I opted to decrease as for a standard raglan, every other round until the desired length. My other reservation is my yarn choice. I bought it assuming that since it was labeled as a DK and looks a bit thinner than a worsted weight that it would get the 5.5 stitches to the inch I needed. To be fair, the label did recommend 5 stitches to the inch and even on a 5 and a 6 I got that gauge. I decided to alter the size I knit from to reach the desired size at the different gauge. 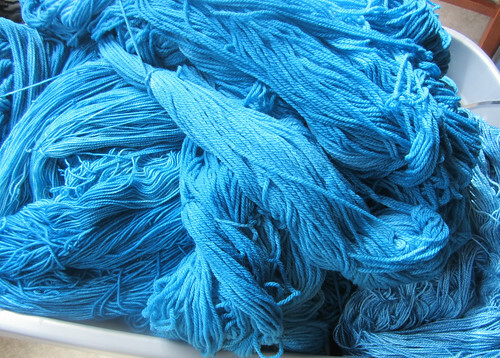 The last couple of times I have half heartedly picked up my knitting I have that niggling feeling we knitters all recognize of a project gone bad. For some reason we continue on hoping it will get better, right? It will pass and when we are done we will like the thing. But, we lie to ourselves don’t we? We will toss it in a heap and be disgusted with it. Don’t be surprised if the next time you hear of this it will be a frogging report. It’s not the design mind you. It’s a perfectly lovely sweater and I did want to make it. It’s me. Wrong yarn and all that. You understand. Maybe I need a start a sock or that baby sweater I mentioned a few post ago. Oh, I also finished the last book in the Outlander series yesterday, An Echo in the Bone. I was quite underwhelmed with the abrupt way in which it just stopped. All the sub plots were just dropped in a way that left me muttering to myself, “That’s it? Really, Just like that?” I mean I know there’s another book coming and all, but I don’t remember any of the others ending like this one did. It felt odd and I am not alone in my feelings. I took a look at the reviews and many others were similarly bothered by it. All I can say is the next installment had better be good, LOL! My next read is the new Stephen King, 11/22/63. I read my first SK book when I was in 7th or 8th grade. It was Night Shift, which is a collection of short stories. I was hooked for life. I then read Carrie and Salem’s Lot, the later scared the crap out of me BTW. I have read almost everything the man has written, although I missed a few in the 90’s and while I own them on my Nook, haven’t gotten to them yet. They are in the queue. LOL! Even when I don’t care for the characters or what they say and do at times, he has a knack for making me know them and he brings them to life. That, and his commitment to the philosophy that the story is the important thing are, I believe, what draw me to his writing. I have a connection with it that not many authors can achieve. Anyway, I have only read the first chapter of this book last night, so nothing to comment on yet, but you will hear more later I am sure. Okay, I will close for now. Have a great weekend!